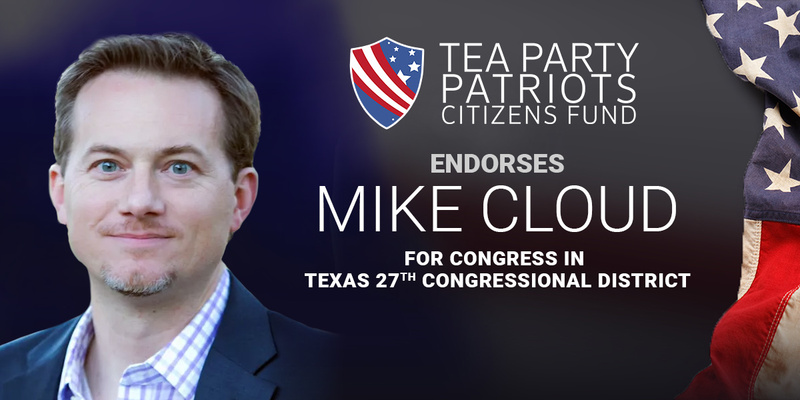 ATLANTA, Ga. – Tea Party Patriots Citizens Fund (TPPCF) Chairman Jenny Beth Martin today released the following statement, announcing that the Super PAC associated with the nation’s largest Tea Party group has endorsed Mike Cloud for Congress in Texas’ 27th congressional district. “For conservatives in Texas’ 27th congressional district, Mike Cloud is the conservative choice. “Mike doesn’t actually want to go to Washington, but he says he’s willing to do it, because he knows Washington needs to change, and we need Congressmen willing to take on the culture of corruption. “Mike is determined to get federal spending under control. He supports a Balanced Budget amendment with a spending limitation, and term limits for Members of Congress. He opposes Common Core and wants to repeal ObamaCare and ObamaCare’s illegal special exemption for Members of Congress and their staffs. “To Mike, immigration is a family issue – his wife is a naturalized U.S. citizen. He wants to build a border wall, and opposes amnesty for illegal immigrants. And he is a strong supporter of the Second Amendment. “Not surprisingly, he has already been endorsed by the House Freedom Fund.